"Floating down the Yuba River, hang gliding off the cliffs at Fort Funston, a day at Ocean Beach with the dog, a leisurely stroll in Golden Gate Park, a fat bag of Trainwreck; these are among the many images that come to mind when listening to Mitchell and Manley's Norcal Values. Inspired by his spiritual advisor, Bettina Richards, Phil Manley recruited the shredding stylings of Earthless' Isaiah Mitchell to collaborate on a record comprised almost exclusively of a single continuous guitar solo. The recording was made live with no overdubs - completely improvised. This recording exhibits inspiration so pure that it could only come from within. 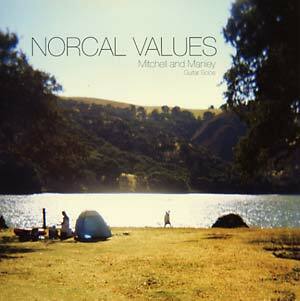 Drawing from the classical Indian music tradition as well as from modern new age music, Norcal Values is the sonic equivalent of fine Californian cuisine."